Finding the right type of engagement measurement for your brand’s Facebook® Page depends on a few factors: your industry, business goals, revenue model, and the makeup of your Facebook Page Posts. We’ve analyzed tens of thousands of brands of various sizes and from several industries to give you the big picture. 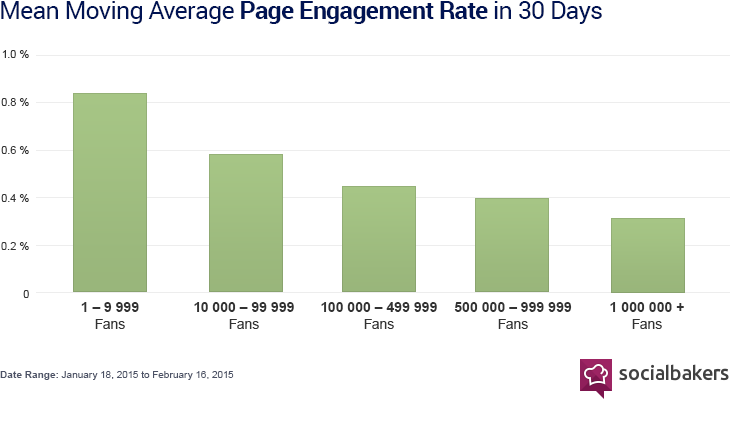 In 2014, we explained how finding the right engagement rate for your Page was determined by its size and how often you posted. Since then, Engagement Rates have failed to account for many of the changes on social. We later showed why absolute engagement (total interactions) were becoming more important, as relative engagement was being influenced by the increasing use of native ads on Facebook. 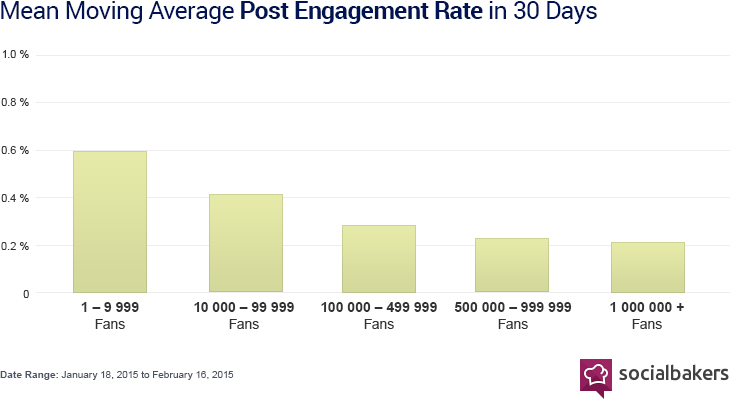 For example, overall Engagement Rates do not account for post boosting which has become critical for social marketers. Bear in mind that the vast majority of Facebook posts are still organic; so Page size to some extent still matters (larger Pages still garner much higher absolute interactions). Join us at Engage Prague 2015 to hear from brands like KLM, LEGO, and Disney, and participate in two days of hands-on workshops with Nestle, Desigual, L’Oreal, YouTube, and many more. We will show you what to measure, and how to measure it, so that you can make your social marketing smarter and more effective than ever. Larger Pages see more absolute interactions and can’t always expect to have the same relative engagement as smaller Pages. This is why we recommend looking at Interactions per 1,000 fans, which can be used for comparing Pages of different sizes. Socialbakers Analytics also includes the Interactions/1,000 Fans metric. While this metric still is by no means perfect – and certainly not the only thing you should be measuring – it can help Pages compare their posts against one another, and broadly paint a picture of performance across fan bases. Success cannot be measured in isolation. Competitive intelligence and benchmarking are both crucial for building the most effective social marketing strategy. In addition, we’ve developed Promoted Post Detection (PPD) to help brands identify their competitor’s Paid and Organic content. PPD data combined with the Interactions/1,000 Fans metric can give an accurate depiction of how your content performance changed as your Page grew over time. It's still worth it for all brands, regardless of industry or Page size, to measure absolute Interactions, since those include non-Fans (which essentially translates to an expanding market). Interactions (Comments, Likes, Shares) vary by industry; this is because it comes down to what type of content people like to talk about. 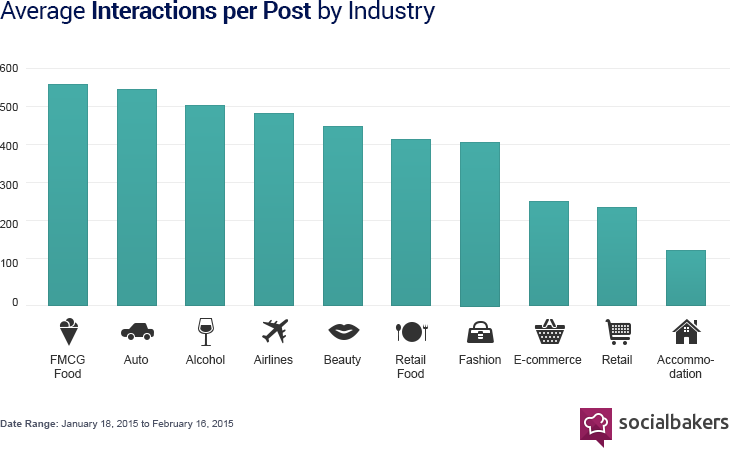 Here we can see that FMCG Food, Auto, and Airlines came out on top in terms of average interactions per post, with industries like e-commerce, retail, and accommodation coming out at the bottom. For brands looking to expand awareness – generally smaller main Pages or Pages expanding an established brand into new markets – Reach Engagement Rate can be useful. This metric (Number of Interactions/Number of People Reached) measures the interactions of those who saw your post – it can be fans and non-fans. This is where Engagement Rate falls short because it assumes that all fans can see your posts (which is far from reality). That’s why it's always better to use Reach Engagement Rate. Unfortunately, Reach ER can't be used for competitive benchmarking, since Reach is not a publicly available metric. Though, it’s still great to measure your performance by comparing Reach ER against post to post. There are innumerable ways to measure social media performance. However, success is relative – it depends on how you define and seek to measure it. Ultimately, the goal should be to increase Social ROI. This begins with creating engaging content – more social engagement means more opportunities for website conversions – the more engaging a piece of content is, the more impressions it will gain. As reach increases, the potential for interactions increases, and new opportunities emerge.